This month we’re having an ALL HERO month and we are so excited to be able to offer a prize for one lucky participant in our challenge this month! For my card, I wanted to make something funny and cute, but still male-appropriate. I took my anchor stamp, and carefully stamped it on a diagonal, using Navy ink, and then mounted that panel onto some dark blue textured cardstock, on an angle and trimmed off the edges. I heat embossed the sentiment in white Hero Arts embossing powder and adhered that to the card. That’s it! 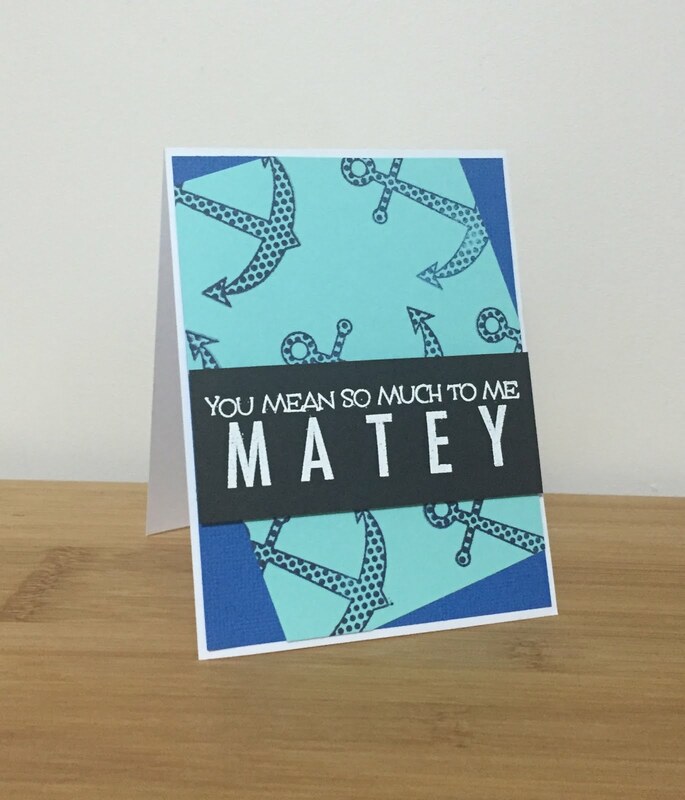 A fun, easy, cute-but-not-too-cute card for a boy/man in your life. We hope you’ll join us for our challenge this month and create something masculine! Can’t wait to see what you come up with. You have until July 29th 5pm to enter via the linky tool below. Please remember to link back to us in your entry post, and use the graphic above too! This is a beautiful card with a fabulous background! TFS I will create and enter this month – have a blessed week! This is awesome!! I love the fun sentiment!! Excellent All Hero and masculine! Nice masculine card! I like those navy anchors on the lighter blue/aqua. I need to have a few of these in my stash since they are harder to make and at the last minute definitely a challenge. Oh, how fun! I love how you did your background on a slant like this!!! I know my hubby would love rec'g a card just like this one! It's a fun masculine design indeed! !